My supervisor at work found the amount of travel I did this semester greatly amusing. It became a regular joke with us. “Where are you off to this weekend?” she’d ask, and we would both start laughing immediately – because she always assumed I would be traveling somewhere, and she always assumed right. Everyone in the office started to take note of my travel schedule, too, and soon I found myself getting lots of questions about it. One of the most frequent queries: Aren’t you getting tired? At first, the answer was genuinely “no.” I love to travel. Love it. I’m always mentally planning my next trip in my head, and I tend to schedule vacations for the maximum length possible because I just don’t want to stop traveling. Ever. But, I’m not a machine. And over time, I realized that, yes, working full-time and traveling – usually to another country – every single weekend was a little grueling (in an “I’m so privileged to get to do this” kind of way). Unpacking and repacking your suitcase, finding flights and hotels, attempting to do tricky currency conversions in your head (thanks for nothing, Hungarian florints and Swedish kronor), navigating unfamiliar neighborhoods, dealing with annoying fellow passengers at airports – it all becomes a grind after a while. It’s totally a good problem to have, I realize, but it’s also true that it does wear on you a bit. My perspective on this issue became clear after comparing two consecutive weekend trips: first, Stockholm, and then Berlin and Dresden. Stockholm, to be frank, did not go as well as I had hoped. 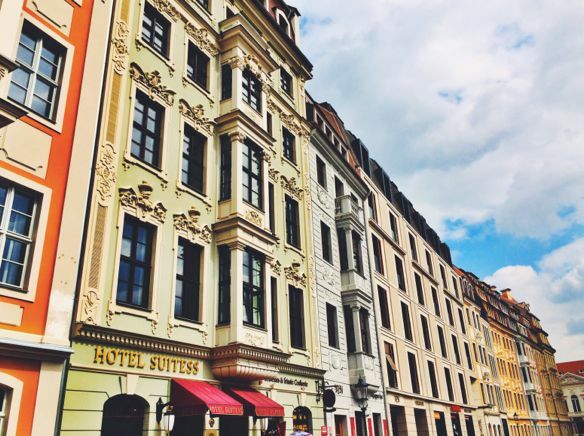 I had heard wonderful things about the city, so I had high hopes – but I just did not connect with Stockholm the way I expected I would (the incredible food being an exception to this). I found Stockholm lovely, but remote. I felt like the prices were even higher than in Switzerland, which was depressing. And, most of all, the city was still in “off-season” hours of operation – meaning I often couldn’t make it to more than one sight in a day, because things would close before I got to them (or, even worse, some attractions I wanted to see were closed entirely). After Stockholm, I would have classified myself as “tired” of traveling. I still had a full month left in Europe – complete with an ambitious travel schedule – so this was disconcerting. Enter: Berlin and Dresden. 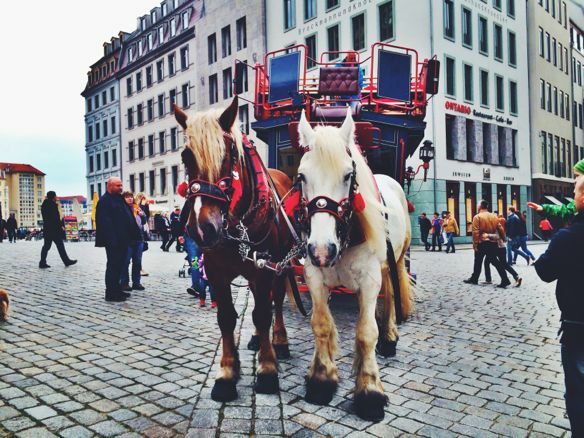 I spent Saturday in Berlin and, suddenly, I was feeling incredibly energized. 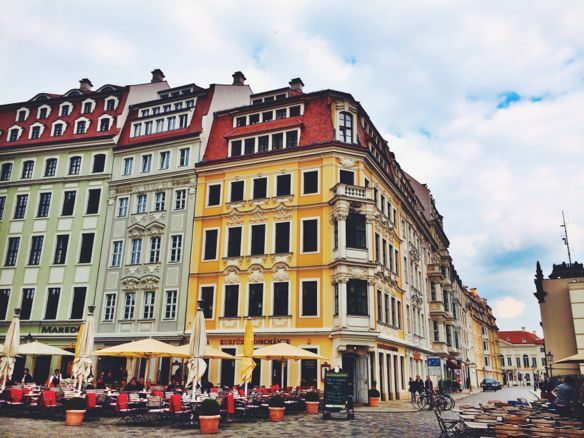 It’s hard not to be energized in Berlin, with its street art, funky culture, and hip neighborhoods. Suddenly, I could not remember why I was tired of traveling. 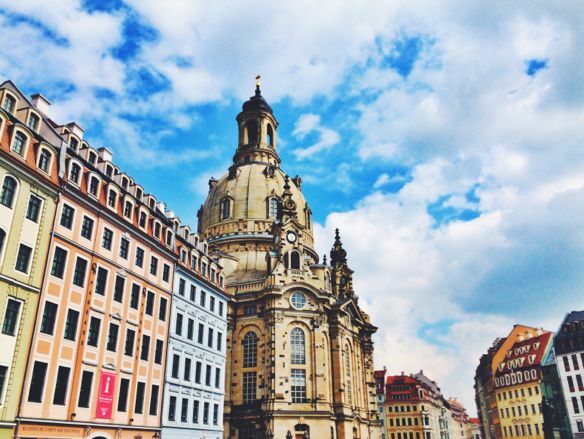 And then…Dresden. Freaking DRESDEN. Almost as soon as I got into town, I was overwhelmed with happiness. 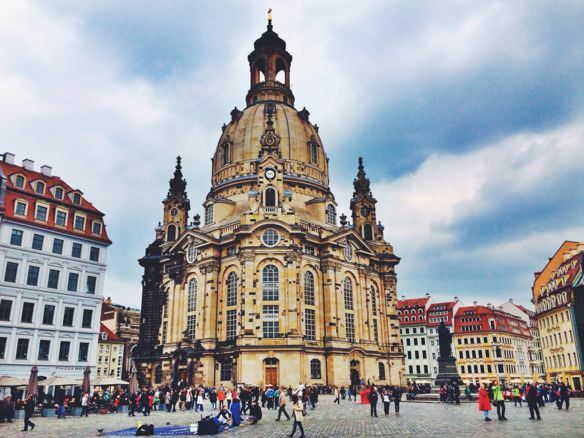 I had heard from multiple sources what a great place Dresden was to visit, but it surprised me just how much I loved, loved, loved the city. 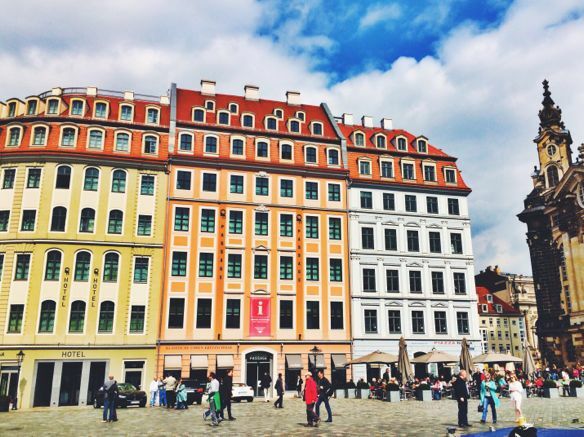 I thought that the Baroque buildings were beautiful and grand and that the city itself was flat-out gorgeous in springtime. The whole town felt like a gem, and I wandered around all day with a gigantic smile on my face. All I could think was: how could I have ever believed I’d had enough travel for the semester? How could anyone tire of traveling, when there are places like this out there? My entire day in Dresden was lovely, but there was one moment in particular that stood out. 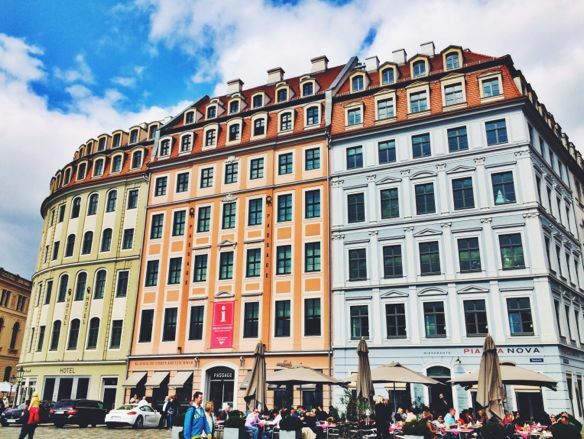 I spent the morning exploring the Zwinger Palace (more on that later), and around midday, I headed toward Neumarkt Square, where the magnificent Frauenkirche towers over rows of perfectly pastel buildings. 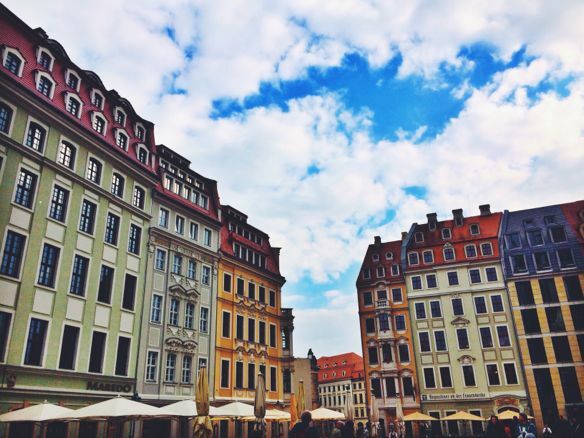 But standing there, in the center of Dresden, I realized that I’m nowhere near that point, and that I never will be. 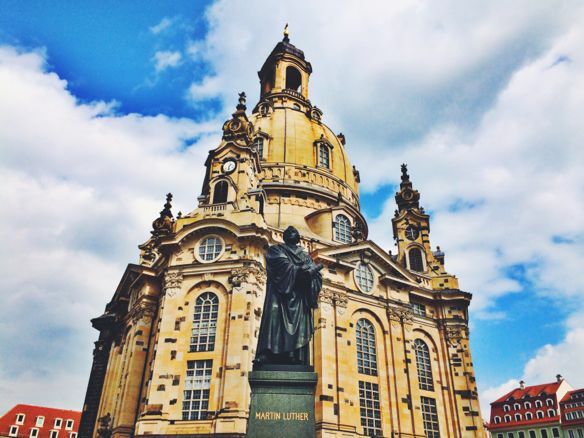 I realized that there will still always be places like Dresden – places that are unassuming at first, places that aren’t quite at the top of your “must see” list but that have the capacity to surprise you with how much you love them. Places that, in short, remind you that you still love travel after all. Much more from Dresden to come!